"Yum! 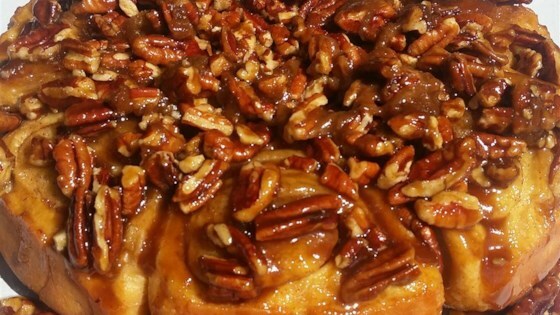 What can be better than a hot sticky bun for breakfast or a late night snack? Pop one into the microwave for a few seconds to make them taste fresh from the oven." Combine the yeast mixture with the buttermilk, eggs, 2 1/2 cups flour, 1/4 cup softened butter, 1/4 cup sugar, baking powder and salt; stir well to combine. Stir in the remaining flour, 1/2 cup at a time, beating well after each addition. Dough should remain soft and slightly sticky. When the dough has pulled together, turn it out onto a lightly floured surface and knead until smooth and elastic, about 8 minutes. Divide dough in half and roll each half into a 12x7 inch rectangle. Spread each half with 1 tablespoon softened butter and sprinkle with 1/4 cup sugar and 1 teaspoon cinnamon. Roll up halves, beginning at wide side. Seal well by pinching the seams. Cut each roll into 12 slices. Coat two 9 inch round cake pans each with 1/4 cup melted butter, 1/4 cup brown sugar, 2 tablespoons raisins and 1/2 cup chopped pecans. Place 12 dough slices in each pan, leaving a small space between slices. Cover and let rise until doubled. Bake in a preheated oven for about 30 minutes. Invert pans onto plates and serve. Should have waited longer for them to rise. i made these for a charity bake sale and they were a huge hit! not too difficult to make and tasted just like the kind you get at the bakery.